I Can’t Stop Spending: Help! Do you ever dream of winning a lottery? A recent study shows that 70% of people who unexpectedly come into a large sum of money end up broke within seven years. You might assume that once you have money…you will always have money. That is just not the case. Most people just increase their spending until everything is gone. As professional credit counsellors, Credit Canada has seen more than its fair share of Canadians who had money but spent it all. You don’t need to win a lottery in order to change your spending habits. Sometimes it takes working with a credit counsellor. If you dread opening your credit card statement every month, now is the time to act. If you’ve tried to stop spending and have failed, don’t give up. By thinking and reflecting on your reasons for overspending, you can gain the insight you need to change. 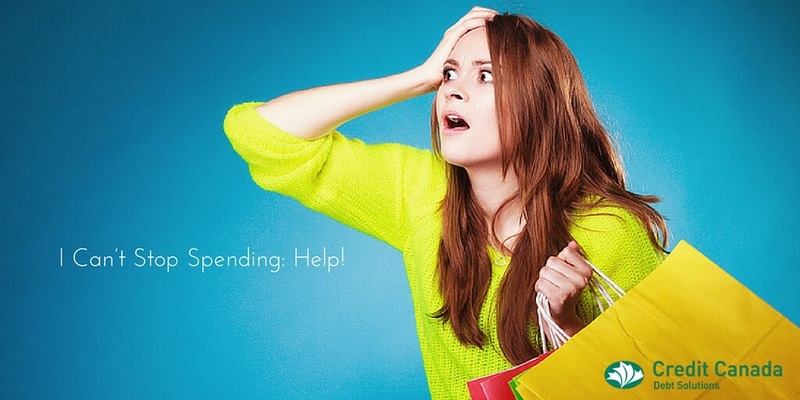 Have a look at the secrets below why people overspend – which ones hit home for you? 1. To Feel Good. For most of us, buying something provides a short burst of good feelings. We might feel power or belonging or status or relief. Usually the feeling is short lived. 2. To Keep up. Do you ever feel that you are the only one with the old car/furniture/clothes? Are you the only one in the room without the expensive latte? Social conformity is one of the most powerful psychological forces and retailers know that. 3. To Feel Normal. To many people, working multiple low wage jobs, owning a home or a vehicle is out of the question. People struggle just to put decent food on the table. Spending can give you a taste of a life that is getting harder and harder to attain. 4. Because I can. Some people spend when they have available credit or cash with little regard to budgeting or future needs. This might be on a Thursday right after they get their paycheque. It might be right after they receive that new credit card in the mail. The question of how they will pay later does not register. Some people require another person or a tight budget to prevent them from spending on impulse. 5. Because I need it (want it). Another reason for overspending is the temptation to confuse what you need with what you want. Spending choices are personal choices and unique to you as an individual. Do you have clothes that you have not worn in more than a year? Are you still buying more? Understanding what you really need can trim your spending. Helping you get out of debt often means our credit counselling will involve teaching you to think about your reasons for overspending. 6. Because my regular routine leads me to deals I just can’t pass up. Have you ever made an impulse buy just because your regular routine exposes you to “deals?” For some people, their routine brings them to retail websites regularly. For others, that Friday night trip to the mall leads to temptation. If you are struggling with overspending, try changing your routine. Avoid that certain store or website. Try something different than going to the mall on Friday night. 7. Because I think I want something (or maybe I was told I should want something). Don’t underestimate this one. Marketers are masters of psychology. Every commercial comes with many months of preparation, millions of dollars in development costs, focus groups and market testing. Both your conscious and unconscious mind are the target. And advertising works. It is shown to influence crowd behaviour…your behaviour. How do you prevent this? It just boils down to stopping and thinking before you make a purchase. Don’t wait for a win in the lottery to get your spending under control. Understanding the seven reasons for overspending can help you start today to get your financial life in order. Credit Canada offers credit counselling if you need any assistance.